Scientists haven’t agreed on whether blondes indeed have more fun, but at least there is some consensus on what makes their hair blond. 23andMe scientists looking at the biology behind hair color found three genetic variants already known to be strongly associated with having golden locks among 23andMe customers with Northern European ancestry. The three variants are on or near the genes HERC2, KITLG and SLC24A4. These findings among 23andMe customers confirm known associations reported on in several other published studies over the last few years. Hair color is a complex trait, meaning more than one genetic variant influences whether a person has light or dark hair. And these three genetic variants by no means account for all the genetic factors that influence hair color, but at least for people with Northern European ancestry they explain a lot. A pigment molecule called melanin determines the color of your hair. People with higher levels of the brown-black form of melanin have darker hair, while people with the lower levels have lighter hair. About 20 percent of 23andMe customers report having light or dark blond hair. While blond hair is most common in people of Northern European ancestry, it is also found in people without European ancestry, but the biology behind blond hair in those populations is different. For example, between five to ten percent of Solomon Islanders have blond hair that is caused by a single variant in the TYRP1 gene. Why is it even important to study these kinds of traits you might ask? Part of the reason researchers look at traits like hair and eye color, is because it provides a broader insight into the biology of complex traits. The color of your hair is not as simple as many might think. 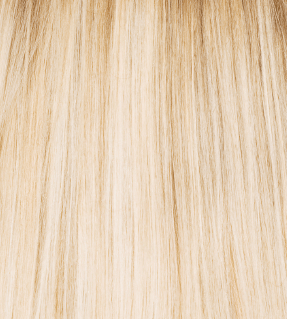 For instance simply having one or two blond hair alleles does not mean that you will have blond hair. In fact most people with just two blond hair variants don’t have blond hair. Only in people with five or more blond hair alleles do we see a majority of them with light hair. By studying complex traits like hair color scientists can sometimes gain better understanding about the genetics of other conditions. Just looking at research about blond hair, for example, has informed scientists about the finely tuned process of gene expression. A 2014 study led by researchers at Stanford looked specifically at the variant nearby, but not in the KITLG gene. The study was fascinating because the researchers showed that a variant in so-called “junk” DNA has a strong influence on the expression of KITLG, which in turn influences hair color. Instead of simply turning on or off expression of the KITLG gene, this variant dialed down the gene expression levels, changing the hair color along a blond to brown gradient. The frequencies of three genetic variants associated with blond hair across Eurasia.